"History Solutions for your Home School"
"How can we see where we are going if we don't know where we have been?" "The study of history is the most fitting nourishment to promote the growth and strength of the expanding intellect of youth..." G. G. Hebbe, Universal History, New York, 1848, p 9. "Dost thou love life? Then do not squander time, for it is the stuff life is made of." Making History Fun to Learn, Easy to Remember! Curriculum materials for home schoolers, private schools, and parents who want to supplement their children's public schooling. Hi! My name is Sharon Anderson, and like many of you, I am a mom who loves home schooling. l am also passionate about teaching history, which is why I started creating timelines over 12 years ago. I have loved getting emails from you and meeting you at conventions. It is fun to find out that your children are exicted about Ancient Civilizations, the Middle Ages, and Inventions, or that you have been using the Old Testament and New Testament materials in a Sunday School class as well as with your Bible studies at home. Many of you use Learning the Bill of Rights in Minutes along with your study of the Constitution. I'm glad that my timeline packets and other materials make easy for you to teach history and that your children love learning about the past. Even though the History of the United States timeline packet covers many events since 1600, every year some of you have asked for a modern world timeline. Now you will be excited that after months of research, writing, and illustrating, IT'S HERE! The most extensive of all the packets, it includes about 800 topics (check out the index), but it can still be used with children of all ages. Use this packet as the basis of your history curriculum or combine it with other materials. As always, students will love learning and reciting the multi sensory History in Action. Take a short history quiz (just for fun). Learn how our unique, principle-based products make history relevant and interesting. Find out how Time Lines can make a difference to you and your children. Renew your appreciation for principles of Liberty that make America great. 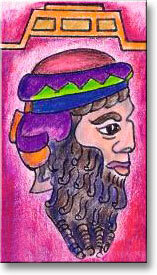 By the way, this is Sargon, one of the first emperors in ancient times. (You will meet him and many other interesting people in my time line packets). Find out today how Time Lines Etc. can save you time and energy . There is no need to wait. As parents we know how quickly our children grow. Time really IS of the essence! To make this site easy to find next time you want to visit, add it to your favorites.